Hitting the gym to keep up with your New Year’s #fitnessgoals can become quite daunting with the chill in the air coaxing you into sluggishness. While it may be easier to stay active during warmer seasons with exciting outdoor activities, there are still plenty of unique ways to get fit while having fun during the winter – without having to use a treadmill. Hiking during winter can be just as nice as in the summer if you’re willing to bundle up for it. Trails are less crowed and more calm this time of year, as frozen waters sit still and fallen snow provides both scenery and sound absorption. 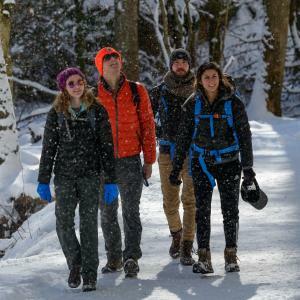 Grab that coat and explore the routes of the many Columbus Metro Parks on your own, or join their annual winter hike series throughout the season for guided public group outings. You can literally elevate your exercise routine with the physically challenging, yet thrilling and mentally-stimulating sport of rock climbing, which can easily be done indoors as well as outdoors. 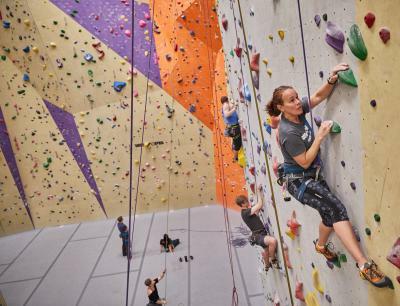 Get this full-body workout at one of Vertical Adventures’ three climbing gyms (pictured), Kinetic Climbing & Fitness’ bouldering center, or hit the hand holds at OSU’s Tom W. Davis Climbing Center or the Westerville Community Center’s Zenith Wall. Although you can’t avoid the cold with this entry, getting active on ice feels most appropriate during winter. For outdoor skating, hit the rink at Dublin Coffman Park, or test the limits of the ponds at Blendon Woods or Battelle Darby Creek Metro Parks, which offer the sport during cold periods. To partake indoors, check out open public skates, figure skating, classes and hockey programs at OhioHealth’s three Chiller rinks and Ice Haus, plus the OSU Ice Rink. A golf outing can be especially undesirable when the green is covered in a blanket of white. Luckily, you can still practice your swing at one of several local indoor facilities year-round. 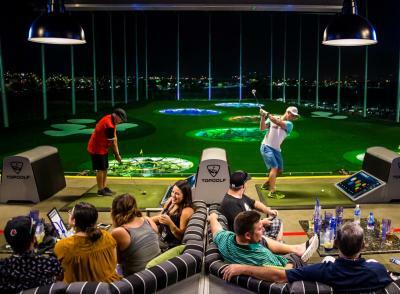 The recently-debuted Topgolf (pictured) offers over 100 climate-controlled hitting bays for mini games and practice, while Teed Up Indoor Golf, The Range and Caddy’s Delight Virtual Golf Lounge all offer dozens of high-tech simulated courses. The comradery of being on a sports team can be felt during all seasons thanks to several spectacular indoor facilities throughout the city. Stars Indoor Sports offers adult leagues in indoor flag football and soccer, the latter of which can also be found at Resolute Athletic Complex and SuperKick. SportsOhio is also a go-to for indoor leagues, offering programs in soccer as well as flag football, volleyball, dodgeball and basketball. By far one of the most unconventional and amusing indoor rec activities Columbus offers is the trampoline park, which has garnered popularity amongst both children and adults. 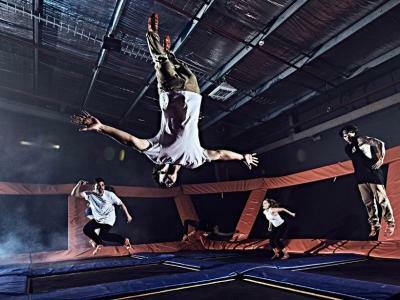 The floors of these facilities are almost completely made of trampolines and foam pits, giving guests the chance to bounce, fly, and tumble across the room and even up the walls. Check out Sky Zone (pictured), Rockin’ Jump, Lazer Kraze, or Get Air to make your workout leaps and bounds more fun. Roller rinks aren’t just for the disco generation. Lace up and get your groove on at United Skates of America or Skate Zone 71, which feature roller and inline skating on their sizable wooden rinks and host live DJs, glow parties, themed skates and even adults-only nights for the 18+ crowd. Mariah works as Marketing Coordinator at Experience Columbus. 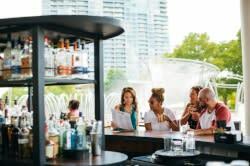 When she's not attending festivals or social events, she's probably cruising the arts scene, catching some live music, or enjoying one of the city's locally-owned restaurants and breweries.